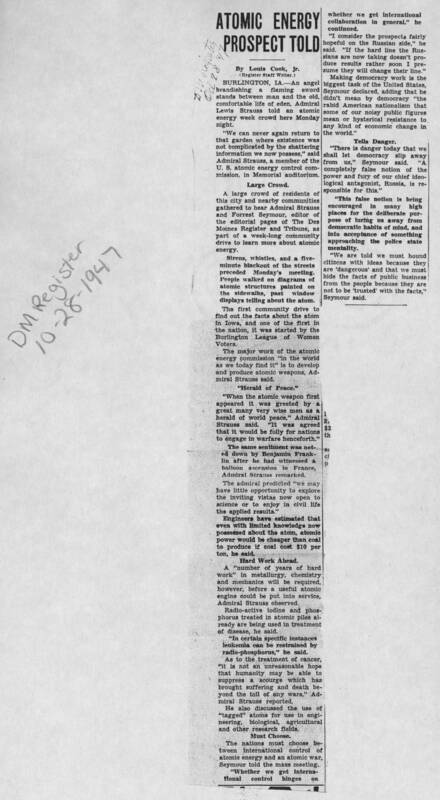 DM Register 10-28-1947 ATOMIC ENERGY PROSPECT TOLD By Louis Cook, jr. (Register Staff Writer.) BURLINGTON, IA.--An angel brandishing a flaming sword stands between man and the old, comfortable life of eden, Admiral Lewis Strauss told an atomic energy week crowd here Monday night. "We can never again return to that garden where existence was not complicated by the shattering information we now possess," said Admiral Strauss, a member of the U. S. atomic energy control commission, in Memorial auditorium. Large Crowd A large crowd of residents of this city and nearby communities gathered to hear Admiral Strauss and Forrest Seymour, editor of the editorial pages of The Des Moines Register and Tribune, as part of a week-long community drive to learn more about atomic energy. Sirens, whistles, and a five-minute blackout of the streets preceded Monday's meeting. People walked on diagrams of atomic structures painted on the sidewalks, past window displays telling about the atom. The first community drive to find out the facts about the atom in Iowa, and one of the first in the nation, it was started by the Burlington League of Women Voters. The major work of the atomic energy commission "in the world as we today find it" is to develop and produce atomic weapons, Admiral Strauss said. "Herald of Peace" "When the atomic weapon first appeared it was greeted by a great many very wise men as a herald of world peace," Admiral Strauss said. "It was agreed that it would be folly for nations to engage in warfare henceforth." The same sentiment was noted down by Benjamin Franklin after he had witnessed a balloon ascension in France, Admiral Strauss remarked. The admiral predicted "we may have little opportunity to explore the inviting vistas now open to science or to enjoy in civil life the applied results." Engineers have estimated that even with limited knowledge now possessed about the atom, atomic power would be cheaper than coal to produce if coal cost $10 per ton, he said. Hard Work Ahead. A "number of years of hard work" in metallurgy, chemistry and mechanics will be required, however, before a useful atomic engine could be put into service, Admiral Strauss observed. Radio-active iodine and phosphorus treated in atomic piles already are being used in treatment of disease, he said. "In certain specific instances leukemia can be restrained by radio-phosphorus," he said. As to the treatment of cancer, "it is not an unreasonable hope that humanity may be able to suppress a scourge which has brought suffering and death beyond the toll of any wars," Admiral Strauss reported. He also discussed the use of "tagged" atoms for use in engineering, biological, agricultural and other research fields. Must Choose. The nations must choose between international control of atomic energy and an atomic war, Seymour told the mass meeting. "Whether we get international control hinges on whether we get international collaboration in general," he continued. "I consider the prospects fairly hopeful on the Russian side," he said. "If the hard line the Russians are now taking doesn't produce results rather soon I presume they will change their line." Making democracy work is the biggest task of the United States, Seymour declared, adding that he didn't mean by democracy "the rabid American nationalism that some of our noisy public figures mean or hysterical resistance to any kind of economic change in the world." Tells Danger. "There is danger today that we shall let democracy slip away from us," Seymour said. "A completely false notion of the power and fury of our chief ideological antagonist, Russia, is responsible for this." "This false notion is being encouraged in many high places for the deliberate purpose of luring us away from democratic habits of mind, and into acceptance of something approaching the police state mentality. "We are told we must hound citizens with ideas because they are 'dangerous' and that we must hide the facts of public business from the people because they are not to be 'trusted' with the facts," Seymour said.